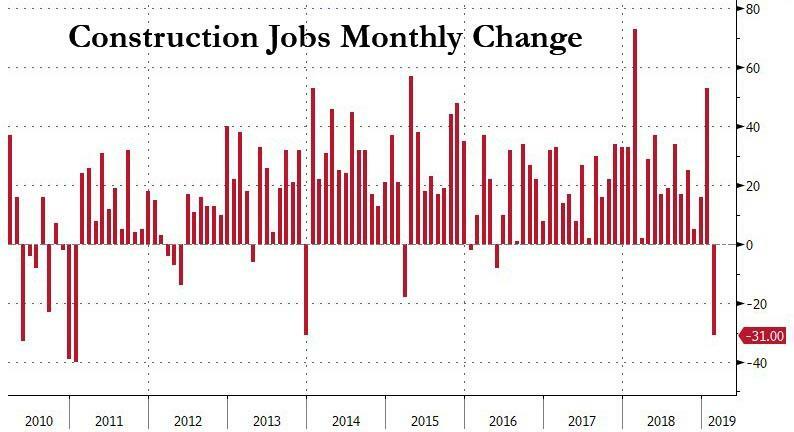 After January's blockbuster jobs report, which was revised further upward from 304K to 311K, February was the payback month with US payrolls rising by a tiny 20,000, one of the slowest months in the past decade, badly missing consensus expectations of 180K, with the miss largely blamed on wintry weather and the government shutdown. Winter weather aside, the February report was a bloodbath, with roughly half of occupations posting either flat job growth or shrinking, with the biggest shocker coming from the construction sector, where 31K jobs were lost, the biggest monthly drop since 2011.
Leisure and hospitality showed no growth while education and health services barely grew. 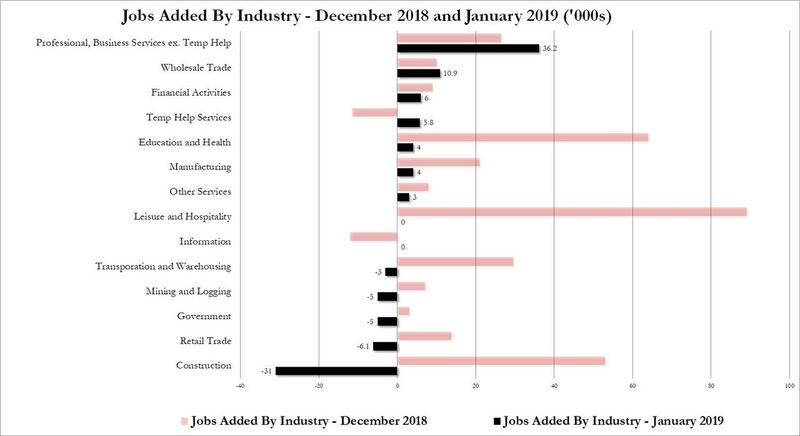 Professional and business services, the silver lining in today's report, continued to trend up (+42,000), while temp-help jobs rose by 5,888. Health care added 21,000 jobs in February while employment in ambulatory health care services edged up over the month (+16,000). Wholesale trade added +11,000 jobs. As noted above, construction jobs declined by 31,000 in February, partially offsetting an increase of 53,000 in January. Employment declined in heavy and civil engineering construction (-13,000). Employment in leisure and hospitality was unchanged, after posting job gains of 89,000 and 65,000 in January and December, respectively. 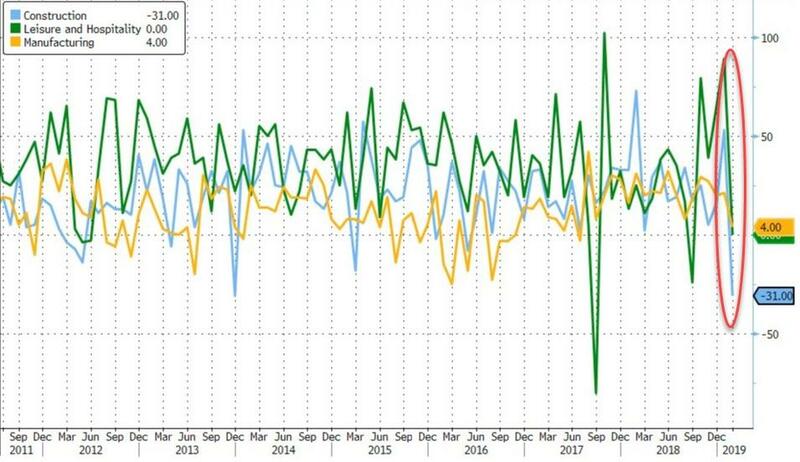 Looking over the past year, the following charts from Bloomberg show the industries with the highest and lowest rates of employment growth for the most recent month. Additionally, monthly growth rates are shown for the prior year. Finally, the silver lining in today's jobs report - the biggest annual increase in wages - had little to do with actual wage growth and everything to do with a drop in weekly hours worked. In fact, average weekly earnings growth dropped in February vs January.